Booths and shops open at 9 a.m.: Whether you love shopping for antiques, handmade goods, or bargains for your kids, be sure to stop at an ATM on your way to North Salem. Vendors will be set up throughout the town, and the permanent shops will be open, as well. Both open at 10 a.m. on Sunday and Monday. 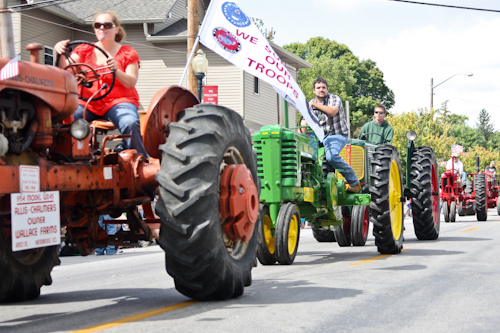 Hendricks County’s largest parade at 11 a.m.: Pack a lawn chair and stake your claim on a prime viewing spot early because the county’s largest parade is not to be missed. People start jockeying for seats at least an hour before the parade begins. Those with an appreciation for antique farm machinery will be amazed by the dozens of tractors that make their way through the town. Live music throughout the weekend: Beginning at 10:30 a.m. Saturday, a wide variety of talented musicians will perform at the NSSB Bandstand in the heart of town. Better-than-fair food: While you’ll always find Indiana-festival favorites like gargantuan tenderloins, corn on the cob, and lemon shake-ups, you’ll also find special treats like fudge and freshly baked loaves of bread. Outdoor movie night at 9 p.m.: Keep those lawn chairs handy after the parade because you and your family will want to come back to the heart of town for the outdoor movie night, back by popular demand for the second year. Car show at noon: If you’re shopped out from Saturday (or are looking for entertainment while your significant other is browsing), check out the car show downtown on Sunday. You’ll see a mix of both classic cars and enhanced newer models. Horse Pull – Heavy Weights at 6:30 p.m.: This is always one of my favorite events of the weekend. 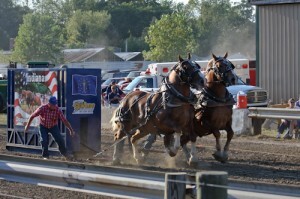 Teams of draft horses travel from neighboring states to compete and see which pair can pull the heaviest weight. The horses themselves are beautiful, their size and power are awe-inspiring, and I love seeing the hours and years of practice evident in the way the drivers and horses communicate. 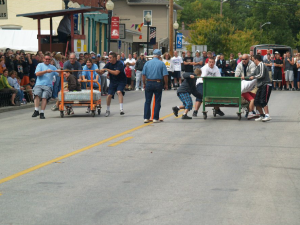 The winning team last year pulled more than 10,000 pounds — that’s five tons! 10K/5K run, 5K walk, and B&O Trail Assoc. Bike Ride: Get some exercise on your day off from work — or cheer on others who are — and come to this scenic race. Registration is at 6:30 a.m., and the races start at 8 a.m. Refuel afterward at the smorgasbord breakfast at the United Methodist Church in town. Pet parade at 10 a.m.: Do you love dressing up your pet—or find it funny when others dress theirs? The pet parade features creatively costumed pets that go far beyond the expected weiner-dog-wearing-a-bun. Bed race at 1 p.m.: You have to shelve your pride to compete in this contest, and boy, is it entertaining when people do! In each crazy, chaotic heat, teams must push a bed on wheels down the street, stop and complete a challenge (such as filling a two-liter bottle with water—while it’s balanced atop the head of a teammate), then race the bed back to the finish. Cash prizes are awarded to the brave top finishers. These are just a handful of the events to come. You can see the full schedule, including the complete lineup of bands at the bandstand on the festival&apos;s website by clicking here and on their Facebook page. Make time on Labor Day weekend to come to North Salem for great fun and entertainment for the whole family. It’s one of my favorite ways to spend the last long weekend of summer. What part of the weekend are you most looking forward to? Amanda is a local photographer, writer and Hendricks County native. She is our go-to resource for the latest happenings in local Arts & Culture and ideas for planning your next Girlfriend Getaway.